"Reveille, Reveille, Reveille — Up, up all late sleepers. You’re tuned to WMEC Forward 9-1-1 on your radio dial. The skies are clear, the temperature is 86 degrees, and we’re currently about 15 nautical miles off the coast of the northern claw of Haiti.” BMC James Jordan’s voice rumbles over the intercom through passageways and berthing areas of the CGC Forward (WMEC-911) with thumping hip-hop music in the background. The crew of the Forward wakes up to Jordan’s booming radio personality voice just about every morning they’re underway. This is the cue for groggy mid-watchers to roll out of their racks and start another long workday. This is the rarely advertised and seldom-celebrated life of the men and women who work on the Coast Guard’s more than 31 medium-and high-endurance cutters. 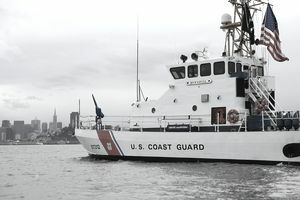 A Coast Guard cutter is a fusion of young and old sailors, those with years of sea time and those with days, those who have traveled the world and those who have never left their hometown. Jordan recites the weather and the plan of the day for the rousing crewmembers, while never breaking from the disc jockey character he plays so well. In a world where routine and tradition are often set aside for operational needs, this is a welcome recurring event. “You know you’re doing a good thing when you can make people look forward to waking up in the morning,” said Jordan. These men and women spend more than 185 days on average away from their family and friends, and aside from the occasional grumble or homesick remark, the men and women of the Forward are happy on the 270 feet they call home. “Underway duty is not necessarily harder (than shore duty), just a different lifestyle. In the end, the missions are a little different, but the goal is always the same – excellence,” said BMC George Smith, the chief of the Forward’s deck division. Every aspect of underway life is vastly different from shore duty at a station, a group or a support unit. People underway long to pull into port to hear the voice of a loved one, while at the same time rounding off an eight-hour workday and eight hours of watch. Mess cooks sweat in a hot scullery washing dishes for 14 hours and desire to be on the bridge or in the engine room learning the trades that may someday be their career. “When you’re on land, you have more chances to participate in your community, but when you’re on a cutter, that is your community,” said Smith. The fact that everything is different is just one of the challenges a newly assigned basic training or class “A” school graduate faces when reporting aboard a cutter. Seamen, firemen, and junior petty officers gather on the mess deck of the Forward just about every night to become proficient in damage control, the only hope the crew will have to save their ship if something should happen underway. The crew is taught firefighting, plugging, patching, dewatering and basic first aid. They are required to know the location of every dewatering pump and firefighting station onboard. This rigorous training is squeezed in between their normal eight-hour workday and eight hours of watch. basis. The ship is transformed into a classroom, where mock fires and engine causalities consume the boat. Ensigns and lieutenants junior grade send repair parties and fire teams out to stop imaginary flooding and fires; young petty officers lead firefighting teams into the engine room; all the while their senior leadership prompts them on the correct procedures and methods. Law enforcement boardings are an equally complicated and important mission. Within hours of becoming the command tasking unit for Coast Guard assets participating in Operation Able Sentry, an operation aimed at deterring illegal migration off the coast of Haiti, the crew of the Forward had already conducted two boardings and was following another seemingly suspicious sailboat in the Windward Passage in the Caribbean Sea. Boardings are an all-hands evolution and come at all hours of the day and night. On April 22, at about 11 p.m., the boarding team was awakened to board a vessel the bridge watch spotted leaving Haiti. The Forward was under strict orders to board any vessel departing Haitian waters. A handful of enlisted members and two officers were chosen to go on the boarding. The six men and women climbed down a ladder from the safety of the cutter to a waiting Coast Guard small boat in the black of night. Because the captain of the 82-foot cargo ship spoke little English, a Haitian interpreter accompanied the team. In heavy seas, the team motored over to a third-world style vessel consumed by rust, corrosion, and filth. The boarding team had to leap aboard at the risk of falling in the dark Caribbean Sea. Once aboard the rickety old cargo ship, the boarding team fanned out and checked every space for drugs, migrants, and weapons, taking care not to slip through one of the many rust holes that dotted the interior and exterior of the ship. The boarding officer and assistant boarding officer headed to the bridge to check passports, visas and shipping documents. Even though there were only six Coast Guardsmen on board the cargo ship, there were many more back at the Forward supporting them. The combat control center kept close contact with the 7th District and reported every detail of the boarding back to them. Electronics technicians controlled cameras and spotlights, helping officers and chiefs on the bridge keep a sharp lookout for the men and women sent to board a virtually unknown vessel. Deckhands waited on the Forward’s boat deck to pull their shipmates to safety after their mission was complete. Engineers responded to every speed and pitch command from the personnel on the bridge. There was even a cook in the galley preparing a hot meal for the crew after the boarding was complete. Each department, each division and each person on board the Forward rely upon one another to accomplish their missions. Cutter teams all across the Coast Guard are answering the call to duty. The commandant of the Coast Guard has temporarily ordered the increase of patrol lengths for all the medium and high endurance cutters in the fleet by 10 days and decreased the frequency of mid-patrol breaks for the crew in response to the nation’s national security needs at home and abroad. This means less time at home with loved ones and less time in port where a phone call can be made. The crew of the Forward is aware of the change, but few seem concerned. No matter how long their patrols are, the crew of the Forward will continue to operate with the rest of the cutter fleet. Crews will patrol the waters of faraway lands and those close to home just as they have done for the past 200 years.